There is a nondescript building just off of Route 51 on my way to work. It's kind of a run down little place, with a couple of garage doors and a bunch of cars parked out front. 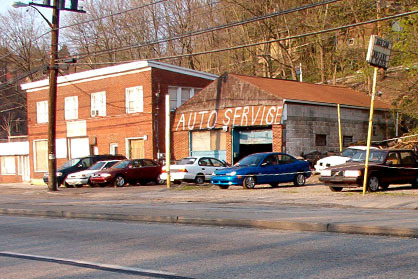 It could be just another used car dealership like many others along the same stretch. But it isn't. In fact, until recently, I had no idea what it really was. Apparently no one else knew either. So the owners decided to share with us what happens in their place of business. Not with a big lighted sign or anything like that. No, that would be too ordinary. Instead, they decided to spray paint directly on the shingles of the building's overhang. AUTO SERVI6E it now says. Whatever that is. There are many things wrong with this situation. The worst of which is probably the decision to spray paint three foot tall words on your building without being sure how to spell both of them. Or the decision to leave your attempt on there for a year. I'm all for the private mechanic. With the number of car dealers and chains around town, it must be difficult to make it in this day and age as a small time auto repair business. But I'm pretty sure this spray paint situation isn't helping things. People expect a little attention to detail when entrusting someone to work on their ride. You've got to keep part numbers, makes, models, and invoices correct. This is not a good advertisement for the quality of work that goes on inside this building. Or maybe it is. I know that I'll never take the Corsi6a there.